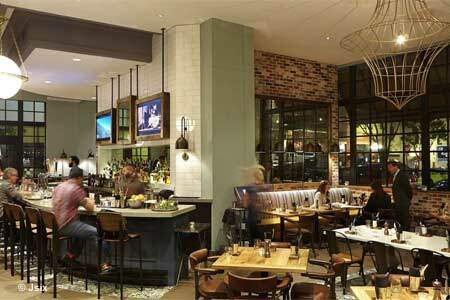 Seasonal California cuisine in downtown’s hip Hotel Solamar. : Jsix focuses on fresh California ingredients with clean flavors and coastal cuisine, taking a "boat to pan" approach, while being conscious of sustainable seafood. Start with organic greens decorated with golden cherry tomatoes, cucumbers, hemp seeds, pine nuts and white balsamic tomato vinaigrette. For shared plates that feed two to four people, there's artisan cheese and charcuterie, then move on to entrées such as grilled swordfish, thyme roasted chicken, crab chitarra or bacon wrapped pork tenderloin. For brunch, we recommend the Jsix chilaquiles, two eggs over easy with spicy dried chili sauce, cilantro, grilled free-range chicken and sour cream. Specialty cocktails change daily; try the tequila Old-Fashioned with Herradura and smoked agave. The hotel setting is hip and modern, and the service savvy.